Go to AVAILABLE, LARGE SLABS, DOLLAR SLABS, ROUGH BY THE POUND, PREVIOUS, NEXT. 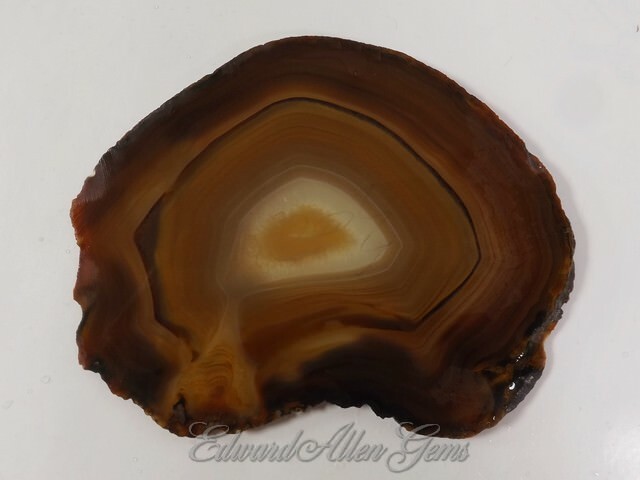 The stones on this page are all unpolished Brazilian Agate slabs and rough, and usually photographed wet. We charge one shipping cost for all that will safely fit in a Small Priority Flat Rate box and will ship to the U.S. as well as Internationally. First Class Shipping available upon request. See our Store Policies for full details. 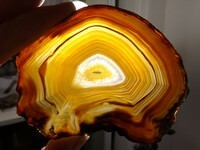 This is another Brazilian Agate slab. It is very orange on one side, but when you turn it over it is more of a soft peach color with kind of a blue edge. It was sliced from a thicker, orange polished slab (this one is not polished). Pretty sure it was either dyed or heat-treated. It is about 4 1/2" x 2 1/4" at the widest points, and 7-8 mm thick. It weighs 102.9 grams, or 3.6 ounces. This is a Brazilian Agate slab. It was sliced thin (3.6 mm) and when held up to the light (main photo) you see the awesome details that create the piece. It is roughly 4" x 3" at its wider points and weighs 59.6 grams, or 2.1 ounces. Note in the 2nd photo you can just barely see remnants of pencil writing, it should erase or polish off. Again, please note how thin it is if your thought is for cabbing. Very neat piece. This Brazilian Agate slice looks like it has some Carnelian in it. It is a nice solid slab, measuring 3 7/8" x 2 3/8" at the wider points, and 6.5-7.8 mm thick. It weighs 84.7 grams, or 3 ounces. Sold - - Contact us for additional items. We have numerous pieces of rough Brazilian Agate slabs (not necessarily like this photo). Contact us and we will get more photographed and up soon. If you didn't find what you were looking for here, please check our eBay Store and search, or select the Slabs category to find similar items. You can also contact us to find out if we have what you are looking for, but have not listed it yet.